Motörhead are true legends! The mixture of whiskey, Rock’n’Roll and the distinct voice of master Lemmy Kilmister always kills. 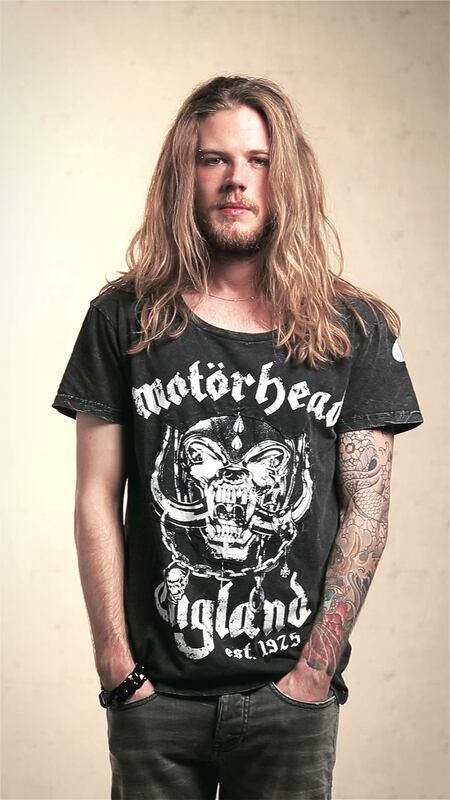 EMP Black Premium has designed a Signature Collection in collaboration with Motörhead. The black shirt features band mascot Snaggletooth and an ace of spades stitching on the sleeve. The cut-outs and the cintage optics make it the perfect shirt. The "snow wash" makes it look like it's been used by a painter and decorator... the material is very thin and the sizing is way off. It measured four inches smaller across the chest than an equivalent shirt in the same size. I notice other reviews have said it accentuates a womans shape - and that's probably true... if you're a woman. This is not cut for a man. Very pleased with the said t shirt.It fits as good as it looks and will almost certainly turn heads when worn out @ local gigs and up and coming Festivals. A must have for all new and old fans of Motorhead and it keeps the memory of Lemmy and the boys alive. I absolutely love this t-shirt and all the detail that's gone into it,the quality is great and I love the fit I was super happy with the neckline as sat lower than it looked it would on the hanger very form flattering for curvy girls and folks who hate high tight necked t-shirts fits in all the right places and is supersoft and has no tight seems(pet hate of mine)love the distressed look to the fabric definitely worth a few extra pennies.